Chateau Font du Loup can be translated into “Fountain of the Wolf.” The name according to the Southern Rhone Valley local folk lore dates back to a time when wolves drank from the various springs located on the property. It’s also the name of lieu-dit, where many of their vines are planted. Font du Loup Chateau Font du Loup came into being when it was purchased by the Charles Melia family in 1942. However, it took until 1979 before the first estate bottled wines were produced and sold. Prior to that time, their harvest was sold to negociants. 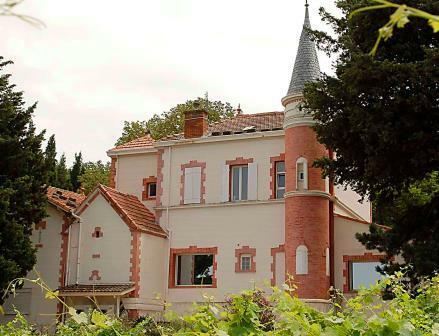 Today, the Chateau Font de Loup estate is managed by Anne-Charlotte Melia and her husband Laurent Bachas. Chateau Font du Loup owns 19.5 hectares of vines in Chateauneuf du Pape. This includes 4 hectares of old vine Grenache that were purchased in 1992. Much of their terroir is located on cooler, sandy soils that is often effected by the famed mistral winds that hit the region. One hectare is devoted to the production of white wine, while the remaining 18.5 hectares are used for planting grapes suited for their red Chateauneuf du Pape wine. The vineyards are 100% organically farmed. Philippe Cambie is the consultant. The best vintages of Chateau Font du Loup are: 2018, 2017, 2016, 2015, 2012, 2010, 2009, 2007, 2005 and 2001. Chateau Font du Loup produces 5 red Chateauneuf du Pape wines and 1 Chateauneuf du Pape Blanc. Chateau Font du Loup Tradition is a blend of 60% Grenache, 20% Syrah, 15% Mourvedre and 5% Cinsault. Since 2003, all the grapes have been 100% destemmed. The wine is aged in a variety of vessels. The Grenache is aged in a combination of tanks and foudres. The Syrah is aged in both French oak barrels and foudres. The Mourvedre is aged in demi-muids. Chateau Font du Loup Cuvee Les Fondateurs is a blend of 50% Grenache, 25% Syrah and 25% Mourvedre. The Grenache is aged in a combination of vats and foudres. The Syrah is aged in French oak barrels and foudres. The Mourvedre is aged in demi-muids. The is aged for between 18-24 months. Chateau Font du Loup Le Puy-Roland is made from 100%, old vine Grenache that is completely destemmed. The grapes from only one, specific parcel of vines. The wine is aged for up to 18 months in vats, tanks and foudres before bottling. The production is on average, 1,500 cases per vintage. Chateau Font du Loup Le Chateau is one of the most unusual wines in Chateauneuf du Pape as it’s produced from 100% Syrah. The Syrah is aged for an average of 18 months in French oak barrels and foudres. Chateau Font du Loup Cuvee Comtesse is made from 100% Mourvedre. The wine was only made in 2 vintages, at least so far, 2000 and 2001. Chateau Font du Loup Chateauneuf du Pape Blanc is a blend of 40% Grenache Blanc, 30% Roussanne, 20% Clairette and 10% Bourboulenc. In 1989, Chateau Font du Loup produced a Cuvee Speciale that has not been made since. Chateau Font du Loup is best served at 15.5 degrees Celsius, 60 degrees Fahrenheit. The cool, almost cellar temperature gives the wine more freshness and lift. Chateau Font du Loup is best served with all types of classic meat dishes, veal, pork, beef, lamb, duck, game, roast chicken, roasted, braised, stewed dishes, barbecue, sausage and cassoulet. Chateau Font du Loup is also good with Asian dishes, hearty fish courses like tuna, mushrooms pasta, eggplant, cheese and tomatoes. The white wine of Chateau Font du Loup is best served with a myriad of different seafood dishes, shellfish, crab, lobster, sushi, sashimi, chicken, pork and veal, as well as Asian cuisine. From 100% old vine Grenache, the wine is ripe, sweet, fresh, earthy and spicy. With its soft textured blend of kirsch, raspberry and kirsch, the fruit stands out on the nose and medium-bodied, soft palate. Early drinking, sharp, bright, simple red berry and olive centered wine for current consumption. Strong garrigue notes with red and black raspberry tones, this medium bodied, peppery wine is already serving up the goods in this 100% Grenache wine. Peppery kirsch sensations coupled with silky textures and a spicy, black raspberry finish. From a blend of 65% Grenache, 15% Mourvedre, 15% Syrah and 5% Cinsault. The wine reached 15% alcohol. Silky, ripe, round cherries, mint and peppery herbs get you going and keep you there from start to finish. The wine pops with anise, kirsch, spice and garrigue. Suave and supple, with character and personality, this comes from an estate that has moved to 100% organic farming techniques. Consulted by Philippe Cambie. Forward, medium bodied, easy drinking, soft, lush wine, with a focus on fresh kirsch, black raspberries and garrigue characteristics.